In my searching, I discovered that perhaps my favorite pulled pork recipe of all time, is one I haven’t even shared with you yet? What is wrong with me?! Apologies. Apologies to you. 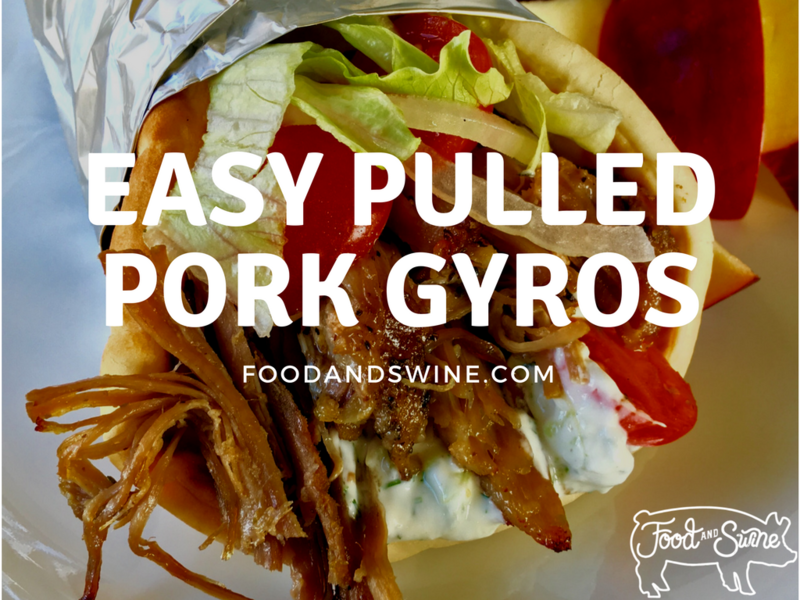 Pulled Pork Gyros are “last supper” worthy and suitable for any party occasion. I’ve even served them layered up on pita triangles as a mini-gyro appetizer. Don’t skimp out and forget the tzatziki sauce, it elevates the entire number! I don’t care how you pronounce “gyro”, as long as you dish up and devour! Cover the pork roast with 1 tablespoon (3 teaspoons) of the Greek seasoning and place into slow cooker. Combine 2 tablespoons of the olive oil and 1 tablespoon of the red wine vinegar, pour over roast. Cook on low for 7-8 hours or until pork shreds easily. Shred pork into larger pieces and remove excess fat. Return to pan juices and add remaining Greek Seasoning, olive oil, red wine vinegar as well as oregano flakes, lemon juice, and honey. Toss to coat. Grate cucumber and squeeze excess liquid out with paper towels. Place in a mixing bowl. Add sour cream and dill. Smash minced garlic and salt together with the back of a knife to turn into a paste. Add to mixture along with black pepper. Stir well, cover and refrigerate until serving. Preheat oven to 450 degrees. Place dressing topped shredded pork on a sheet pan, bake for 10 minutes until caramelized. Place pita round on a plate; add a layer of tzatziki sauce, pulled pork, tomatoes, onions and lettuce. Fold over, wrap with foil if desired. Serve immediately. If you want to be bold and serve this in an alternative way, layer all the components on grilled naan bread and cut into squares, delish!